For information re concert and Kate McGarrigle Fund of the SFA. Shall we say sevenish ? Any chance of auctioning some signed posters on ebay? I am upset with myself and my current workload that I was not able to attend. I hope there are other concerts in memory of Kate. I will send a donation. I did attend the Pete Fornatell MIXED BAG concert at the Beacon in the late 80s. 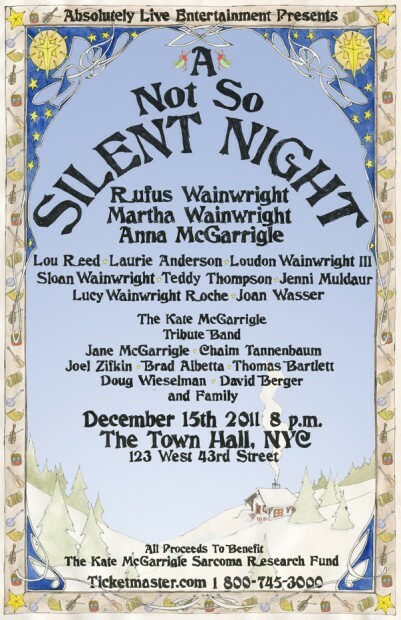 Suzanne Vega, Janis Ian, Maria Muldaur and the McGarrigle’s, including Janie. Good thoughts to all of Kate’s family and friends just after the 2nd anniversary of her death. and on her birthdya.